Last week, TeamMate released their latest album via Rostrum Records (home to Wiz Khalifa, Mac Miller, The Bird & the Bee etc.). The TeamMate duo is made up of Scott Simons (keys, synths, vocals) and Dani Buncher (vocals, drums). They have a pretty interesting love story. They were romantically involved for close to a decade, but Buncher’s coming out ended the years of calling each other boyfriend and girlfriend. 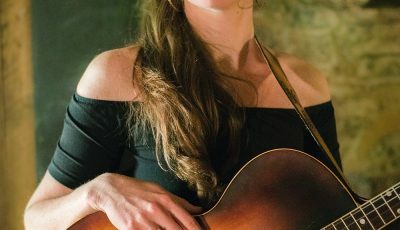 Unlike most couples who repel after a break up, the duo’s love and chemistry went down a new path and was channeled into their unspeakable musical connection. Clearly, this was much easier said than done. There were a lot of emotions and frustrations to work out, but having this creative outlet with each other carried the two through the rough patches and acted as their therapy. Together they have mastered the art of writing smashingly catchy pop gems with immense lyrical depth, writing from their personal experiences. They sing 90% of the album together because they are telling THEIR story, and what THEY have been through as a couple, a band and business partners. This strong sense of togetherness and telling their story has had them coin their style of songwriting as ‘experiential optimism.’ Together, they have been through the ringer of human emotions, they survived and are stronger because of it, so like to focus on the positive. 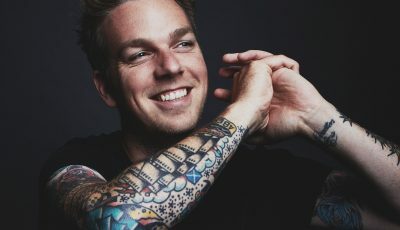 Although the story that they write on this record is specific to them, there are a lot of themes, topics and emotions here that are universal, that can connect with wide audience. 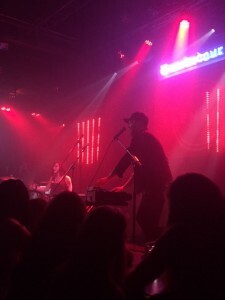 Last year in addition to a packed residency at the Satellite in LA, they supported Empire of the Sun, The Groves, Nina Diaz, The Shadowboxers and AWOLNATION, and are currently supporting Frenship this month. All Access just so happened to be at their show last night (Tuesday, February 21st) at the West Hollywood venue Troubadour. 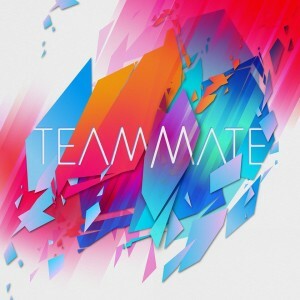 TeamMate played songs off their new album including “Don’t Count Me Out,” “Nothing’s Ever Over,” “Souvenir” and their current single, “Damage.” They even covered Pat Benatar hit song “We Belong” which the crowd really enjoyed. Their on-stage chemistry was clearly visible and it was fun to see them create a light-hearted party atmosphere in the space. It was a short but sweet set and certainly got this writer wanting more! Scott: Thank YOU for YOUR time. Man… 2016 is bipolar. We had so many great things happen on a personal level but there was so much bad that happened worldwide that it’s hard to celebrate. We are appreciative that we get to make music and that people listen to it. We are super super lucky to do this. Dani: Exactly. We feel very fortunate to have a personally fulfilling creative outlet. What were some of the highlights for the band? What are you all most excited about for 2017? Scott: 2016 was a big year of growth for us. We had taken 2015 off mostly to write the album and retool our live show. By April, we played our first show back at the Satellite, a great smaller venue for up and coming and established bands in the Silver Lake area of Los Angeles. 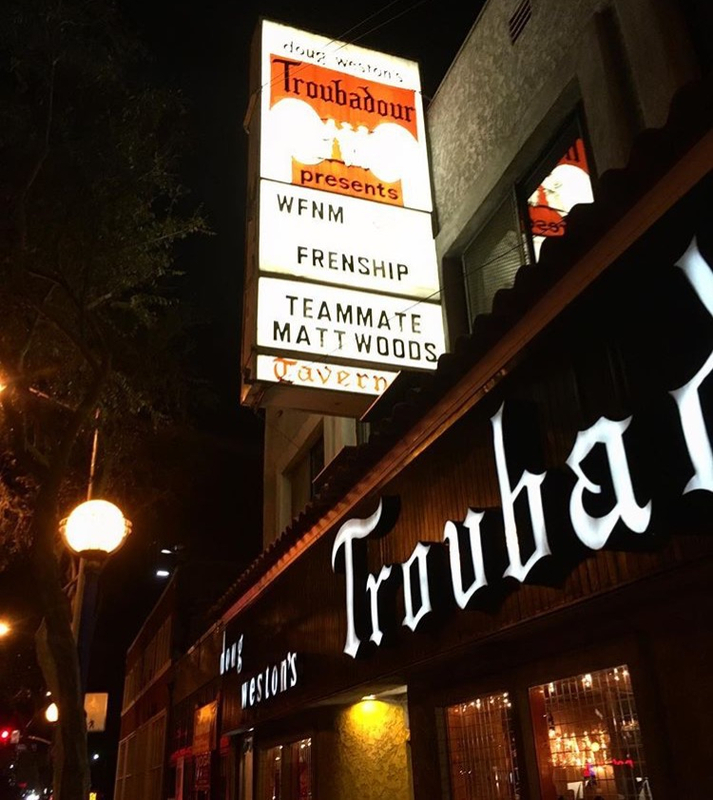 In June, we opened for AWOL Nation in Louisville, KY and at the end of the year, we opened for Empire of The Sun at the NOVO theatre in Los Angeles and played our first show at the legendary Troubadour in West Hollywood. In 2017, we’re excited to finally put our first full length album out. And we’re excited for the opportunities that could create, especially with the team we have in place around us. How did TeamMate first form? How did you come up with your band name? What other names were you considering? Scott: Well, we met in college at West Virginia University and dated for ten years. We broke up and were sort of reeling. We knew we wanted to stay in each other’s lives but we weren’t sure how. I moved to LA, Dani stayed in Pittsburgh where we were living together. After a few years of doing the songwriting for other artists grind out here, I was itching to do my own music again. 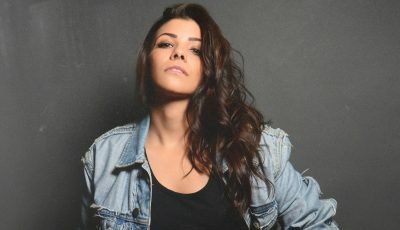 Dani: Right before we formed the band, officially, I went through a breakup of my own. Scott wrote a song, for me, to help me get through it. We went into the studio together, I recorded drums on the the track and that was the first time we recorded together. No idea where that song is now and hopefully know one will ever hear it, ever. Scott: Yeah, and then I was doing some singer-songwriter shows back east and asked Dani to sit in on drums. Immediately, there was a spark on stage and we were like: Wait, what if we started a band? That crazy little idea has just snowballed into what we are today. Dani: I don’t think we had a lot of other band names in consideration. TeamMate always felt right. Scott: Yeah, I don’t remember any other names we considered. We came up with TeamMate pretty fast because it described our second phase of our relationship perfectly: If we couldn’t be partners we should still be teammates. I’m curious what it has been like being in this band together since you split up? How did your musical connection grow once you were no longer romantically together? Scott: Honestly, and I don’t know if Dani agrees, but we are even better bandmates than we were a couple. I joke that we broke up before we even wrote a song so we can take the ups and downs that come with the music industry. We’ve been through a lot of stuff together and we’re still standing. As we’ve matured and now live in the same town again, we are closer and more open than we’ve ever been. I think playing and writing music together has helped that. It’s basically our therapy. We can sing the things we’ve never been able to say. And when you’re being creative with someone you really have to trust them. You have to be open and solid enough to come up with super bad ideas and not be afraid of what they think so you can get to the good ideas. Dani: Agreed. A lot of what comes along with being in a band is similar to being in a relationship. Knowing how to communicate with each other is crucial. Our history as a couple allows us to recover from arguments and disagreements in a peaceful manner. Since we know each other so well, we’re able to say things to each other without any insecurity or fear of criticism. Our friendship has grown just as much as our musical connection and that’s been the best part. This February you will be releasing your full-length debut album. Can you talk about putting this collection together? What does it feel like to be putting out this album? Scott: It’s such a relief to finally have it out. We’ve been sitting on some of these songs for awhile just waiting for the right time to release them. The songs are written from personal experience but we hope they have universal appeal. We’ve written songs celebrating our relationship now, our breakup, our beginning of our friendship and even some experiences dating other people. Production was done by me mostly in my apartment with the exception of the drums which we tracked in studios here in LA and Pittsburgh. What was the inspiration for the songs on this album? Did you write some of the songs as a couple and then some of them after your stopped dating? Dani: I don’t think we would have enjoyed seriously playing music together as a couple. Having that outlet, outside of the relationship, was probably a healthier dynamic. For us, it was a nice way to separate our identities a little bit. We were both each others biggest fans and that was satisfying enough. Scott: Yeah, we never played music as a couple strangely, except for maybe a couple of times when our parents would beg us to play together. We each had our own thing going musically and we didn’t overlap that much. When we first started TeamMate, the writing ideas were coming a lot from me but on this record, not only did we write everything 50/50 but we also sing most of the album together in unison. How did your current single “Damage” come together? Scott: This is one of our oldest songs. We’ve been sitting on it for a long time but playing it live and it’s always gotten a great reaction. It was written while we were still living on separate coasts. We even tracked the drums over Skype – Dani in Pittsburgh and me in LA. The lyric idea came from us thinking, “Man, if we could find a way to get past this breakup and really focus on this band and our friendship, we might really be onto something.” That’s the basic gist. Why do you think Rostrum Records is the right label for your music now? How do you think you compare to the other artists on their lineup? Scott: Rostrum has always been the perfect label for us because they’ve been so patient and we’ve gotten to watch them grow as they have us. We had both spent a lot of times in DIY bands and we carried that work ethic into TeamMate. So we’re very hands on and Rostrum allows us to do that and also really listens to and values our input and concepts for the band and how we want to be presented. They have a lot of other great artists. We’re probably closest with Donora because we did a few van tours with them a couple of years ago. Mike Taylor played our residency last summer. We’ve shared the stage with Vali at SXSW. We did a remix for The Bird and The Bee who we’re massive fans of. It’s just a great and inspiring group of people. How was your packed residency at the Satellite here in LA last year? Do you have plans to do another one soon after your album comes out? Any other touring plans in the near future? A show with Frenship next month? Dani: Not sure we have any more residencies planned at the moment but definitely some fun shows lined up. Scott: The Satellite residency was amazing. It was fun to watch each week grow. The Troubadour show in February with Frenship will be our album release show. We’re really honored they asked us to do the show with them. It’s gonna be a fun one. Dani: Recently I’ve been revisiting a lot of records by Yeah Yeah Yeahs, Pinback, Hot Hot Heat, and Metric. I’ve always been inspired by those bands and I keep them in a steady rotation. Scott: I listen to a lot of everything. I try to keep my production game up by listening to what’s going in a lot of genres. I really liked Chance The Rapper’s last album. And Tegan and Sara have been one of our mutual favorites forever. But also, I like to listen to a ton of podcasts. Stories and interviews really inspire me, keep my head straight and give me lyrical ideas. Plus, it’s nice to just hear monotone speech sometimes when you hear music 24/7. Ira Glass is my Beethoven. I would love to work with Greg Kurstin or Jon Brion. They’re fantastic musicians and producers. We reached out to some mega 80’s hit songwriters last year to see if any of them would co-write. We got some nice email replies but no bites. We’ll keep trying. Scott: I hope people get whatever they need to out of our music. I’m always surprised by how people hear things in ways we didn’t intend but make total sense. That said, we’ve had people come up to us at shows and message us online that our story helped them get through similar situations. I think if we have one thread that runs through our music it’s that love has a lot of different shapes. And no one can define it for you. Scott: I mean… we’d like to plug these socials, you know what I mean? (Laughter) @teammateband on all the social media platforms. Holler. But also, we truly appreciate music fans and listeners out there who keep us going. We love making music together and we are lucky to have people that let us do so and pay attention.